Spaghetti with Clams and Toasted Bread Crumbs takes its inspiration from two dishes–spaghetti alla vongole, a dish of string pasta with clams popular in Naples, Rome, wider Campania and farther north along the Italian coastline; and pasta con il pangrattato, pasta with breadcrumbs, a very basic dish of la cucina povera, the cooking of the poor. At its most elemental the latter contains no more than pasta, breadcrumbs, oil, salt and a bit of garlic. Variations include raisins, cauliflower, anchovies and olives, which is to say that a little stale bread, some pasta and oil is all you need for dinner–if you have anything else you can dine in the lap of luxury. I once read of an Italian winemaker who described an upbringing of such deprivation that the only seasoning in his childhood home was a single dried sardine hanging from a string fixed to the rafter above the kitchen table. At mealtimes family members, beginning with the father, would each take a turn rubbing his portion of firm polenta against the sardine for flavor. I’m sure the man was exaggerating, but the story nevertheless makes sense. The stone soup wisdom of all poor cultures is the same–a smidgeon of something with a lot of flavor improves the pants off a lot of something with little flavor. 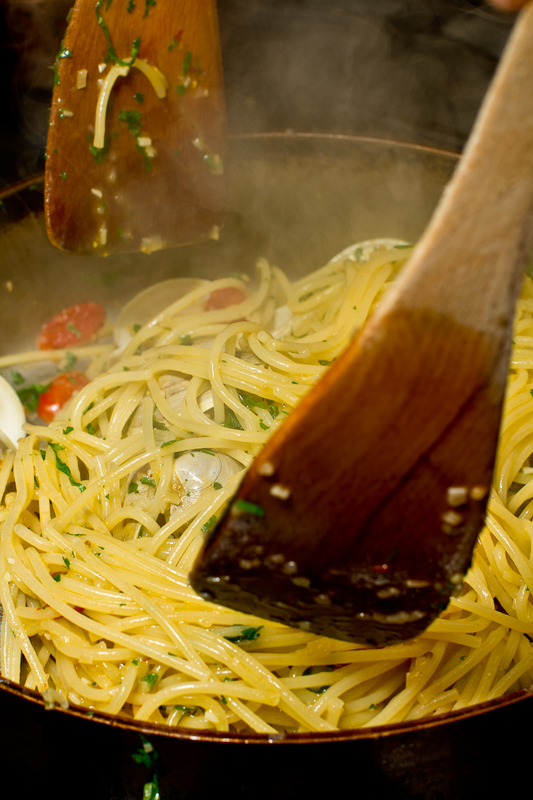 Breadcrumbs, olive oil and garlic add enough sensual satisfaction to elevate pasta far above a sense of deprivation. The first time I heard about pasta with toasted bread crumbs I thought my wife was kidding me. Maybe she meant cheesy breadcrumbs. Or crumbs from really good bread. But no. She meant just what she said: breadcrumbs, olive oil, salt, pasta. That’s what you eat when life is stripping you down, and if some wild greens or garlic come your way, you’re happy to have them. With clams and some tomatoes and parsley added to the mix the dish becomes a feast. And you don’t even have to rub it with a dried sardine. 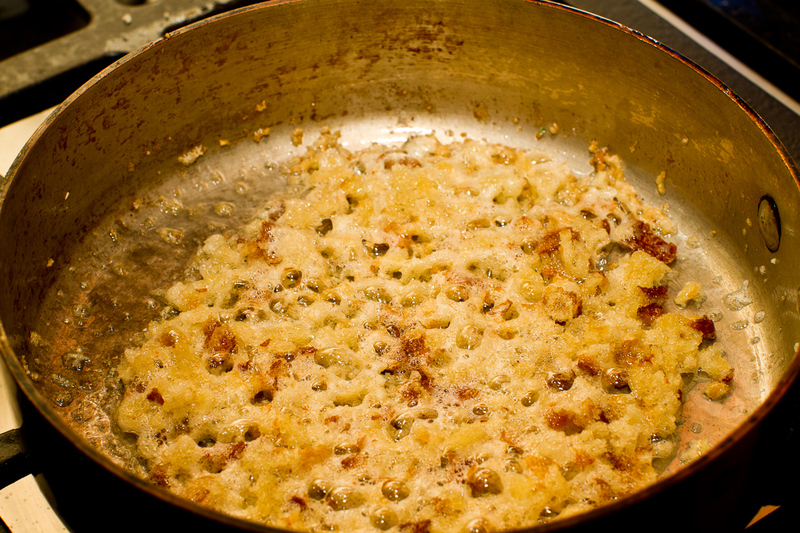 In a large deep-sided pan, warm the extra virgin olive over moderate heat. 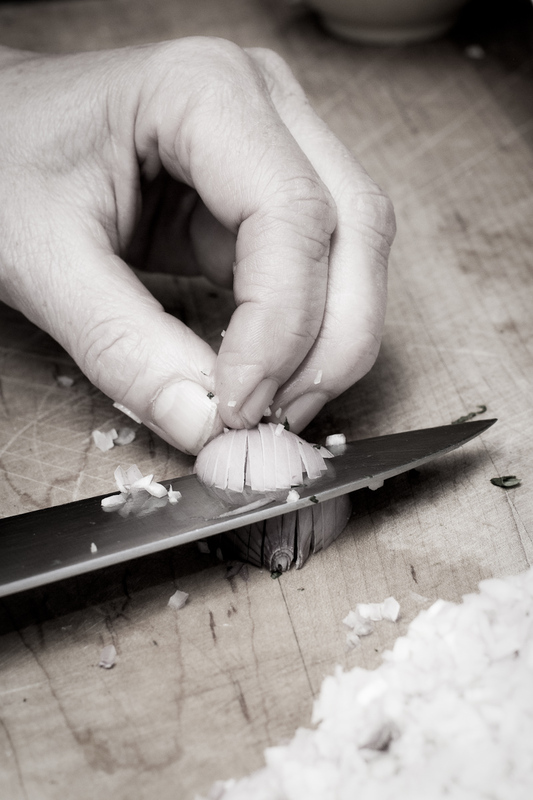 Add the shallots and garlic and cook, stirring frequently, until tender. Add the tomatoes, pepper flakes and fennel seeds. 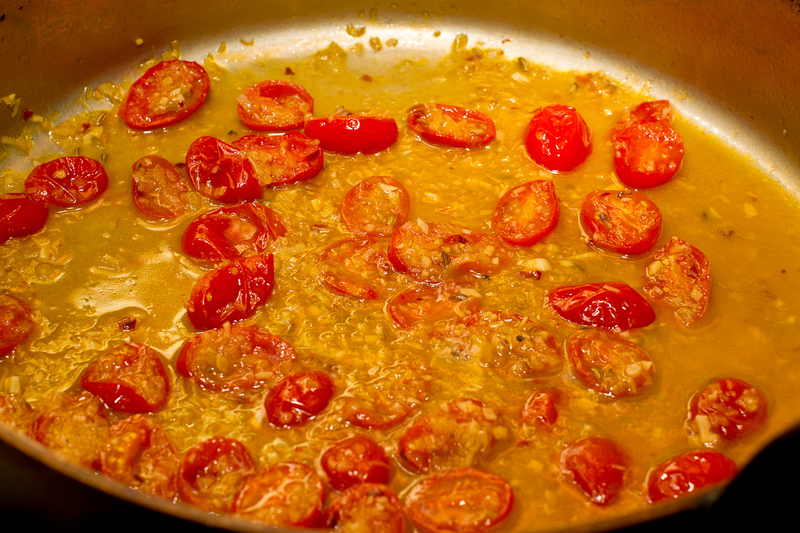 Season with salt, reduce the heat to low and cook 15 minutes or until the tomatoes start to shrivel. (Right now is a good time to put a large pot of water on to boil for the pasta.) Add the wine and clams. Cover and steam until the clams open, 5-8 minutes. 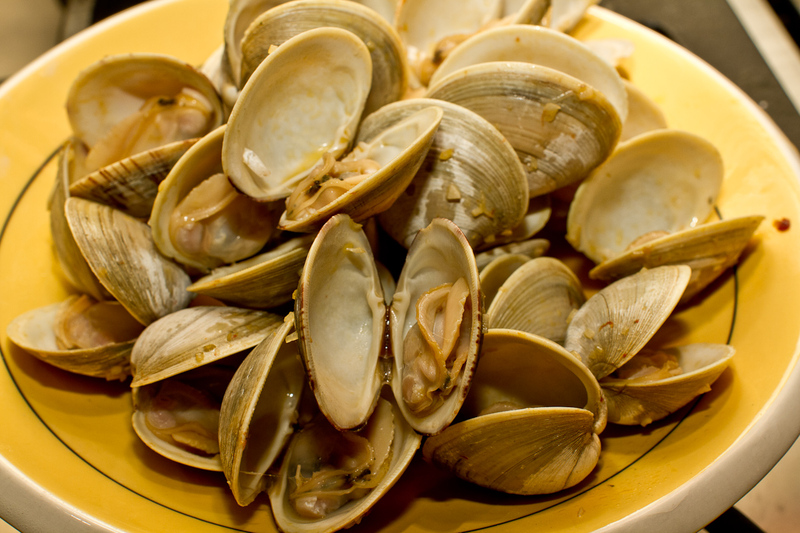 Transfer the clams to a large plate as they open. 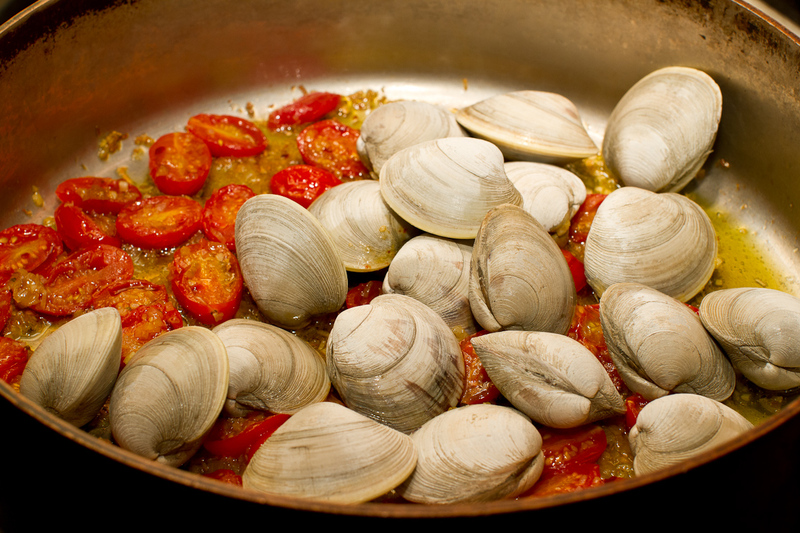 Turn the heat off under the pan with the clam juices. Meanwhile, bring a large pot of water to a boil. Add salt and then the pasta. 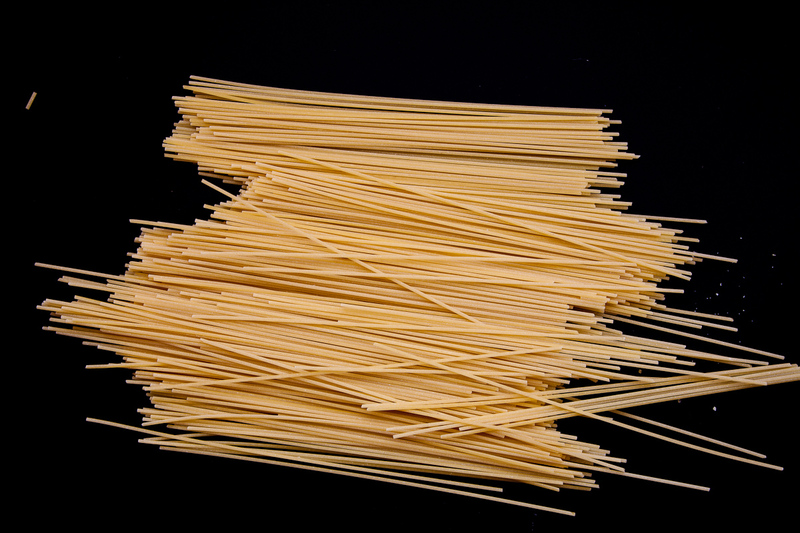 Cook the pasta until al dente, about 5 minutes. 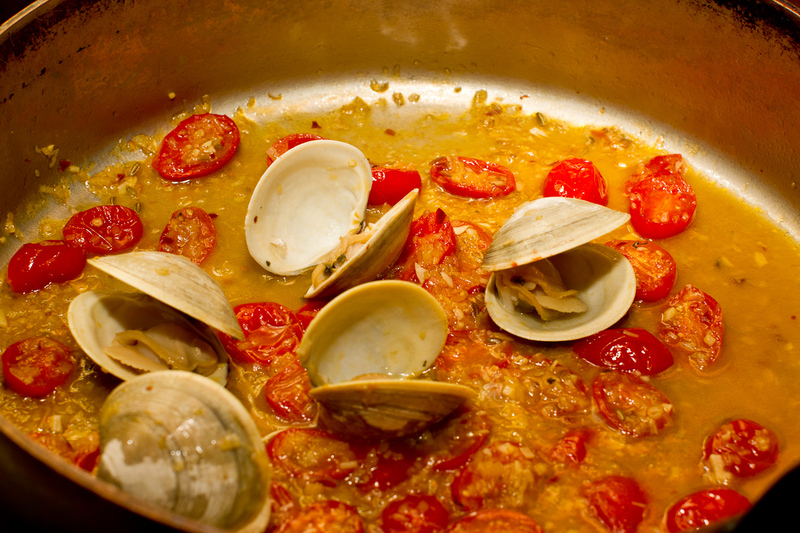 Scoop the pasta out of the water and pour directly into the pan with the clam juices. Cook for 3 minutes or until the pasta is well coated. Add the clams and herbs and toss until heated through. 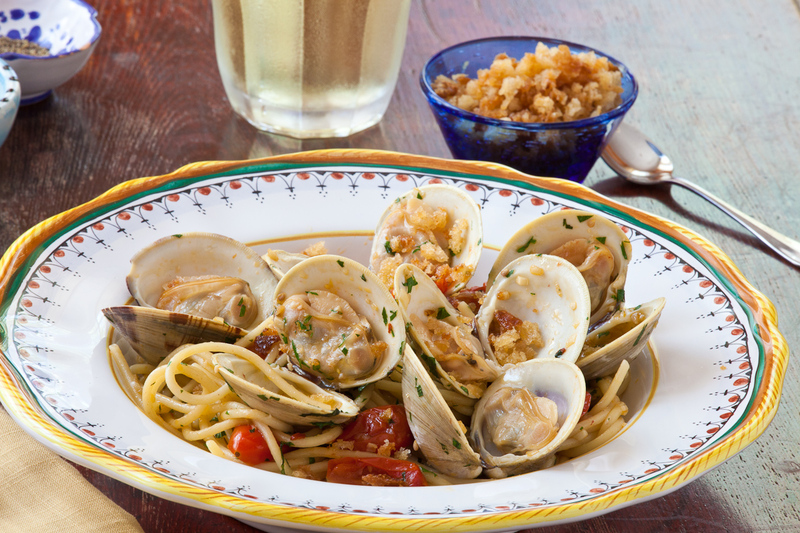 Divide the pasta and clams evenly among 4 warmed pasta bowls, top with breadcrumbs and serve immediately. Serve extra breadcrumbs and chili flakes on the side, if you like. 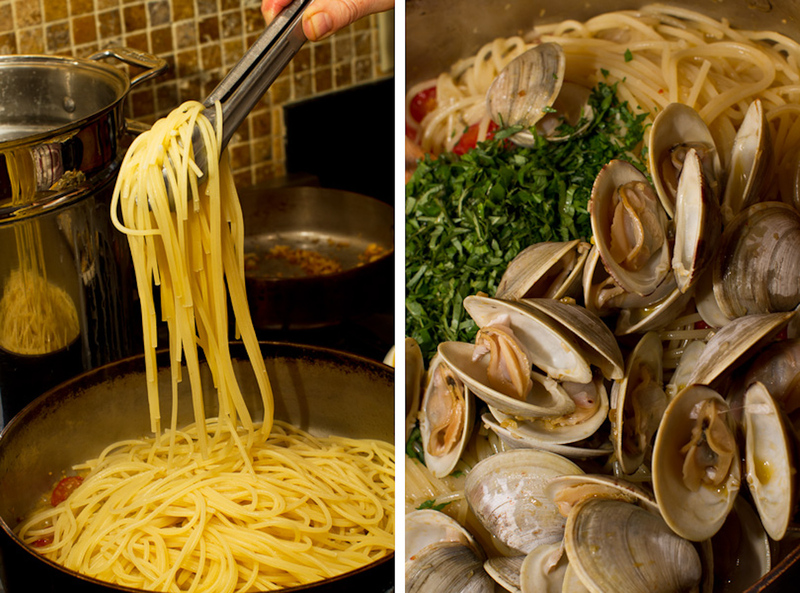 When we were growing up, spaghetti and clams meant a simple sauce of fresh garlic cooked in olive oil (extra virgin olive oil hadn’t appeared yet), chopped canned clams, some clam juice, and parsley. It was Italian in spirit, with just enough boldly flavored sauce to coat the pasta. I loved it, despite the textural resemblance of the clams to pencil erasers. As a recent graduate from college on a tight budget, I often made this dish for myself and welcomed those little clams. 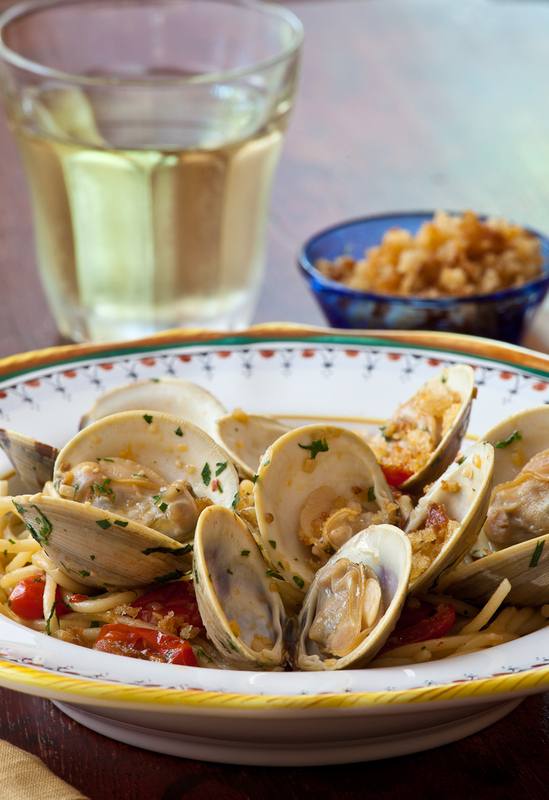 Years later, my first meal in Italy was spaghetti with clams in the coastal town of Ventimiglia. It was a different animal. 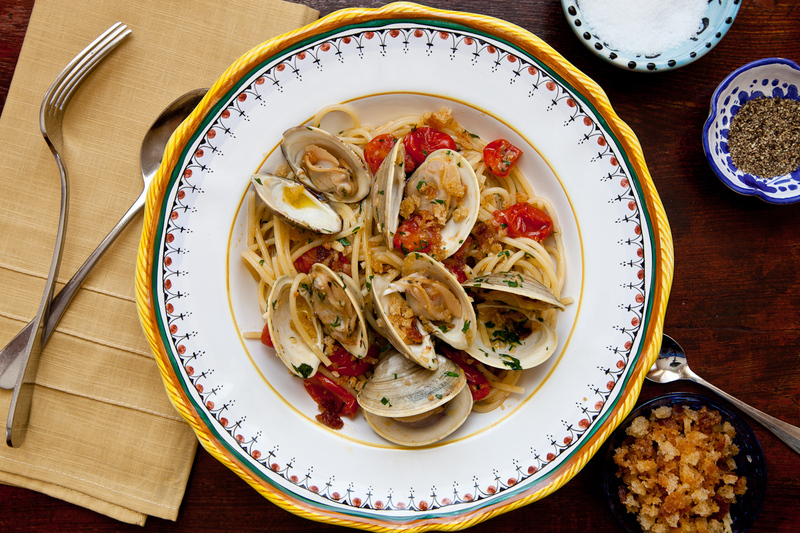 The spaghetti was coated with Ligurian olive oil, the clams were tiny little tender things in their shells, there was parsley and garlic and the addition of fresh ripe chopped tomatoes. It remains one of my favorite dishes in the world. Of course now I’m using fresh New England clams from our friends Patrick and Barbara in Wellfleet, and that makes it as good as the original. This entry was posted in Dinner, Easy, Entree, Seafood and tagged breadcrumbs, clams, cucina povera, pasta, seafood, spaghetti. Bookmark the permalink. I’ve never been a huge fan of pasta and clams, though after having enjoyed Pat and Barbara’s Wellfleets the other night at your PMC party at Rialto, I think I may need to give this dish another chance. 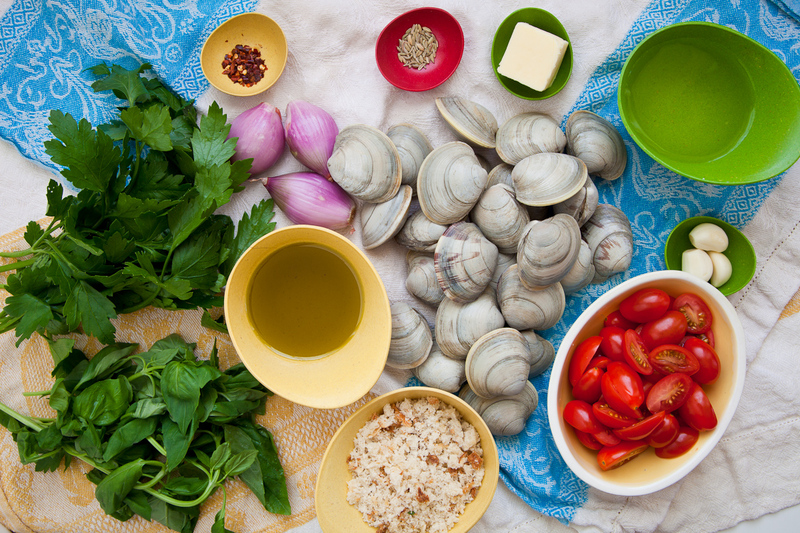 Both raw and baked their clams were a revelation, and I bet they would be amazing in this classic dish. My husband loves “spaghetti alle vongole” but I haven’t made it since we were in London. Bread crumbs on pasta does admittedly sound funny, just as recipes I’ve seen for pasta and potatoes–starch + starch. But toasted in olive oil sounds tasty. My current rendition of this would have to be cucina povera indeed–I realized last night that I am out of pasta! (But I do still have about 20 cans of sardines). Simple things are the best, particularly when it comes to pasta, I can imagine how satisfying this dish is. Great recipe. Fabulous pictures, and now I want this! Thanks for sharing. Just tried this. Delicious! Modified some as I didn’t have all the exact ingredients. Dish came up wonderfully. I always laugh about the fact that, when we met, linguine with clams was one of the two dishes that Steve knew how to make (chicken or veal Marsala being the other). Those were canned clams, of course—the best that could be done here in the upper South in the dreadful ’80s. But he made it with lots of decent olive oil (shipped from Italian relatives in N.J.) and a ton of garlic, so it was pretty darned good for those days! This elevated variation looks wonderful. Can’t wait to try it. My wife made this last night for a dinner for six – it was a hit! She made homemade pasta, and as we are weekending in Ptown, we found Wellfleet clams at the farmers market. The breadcrumbs did indeed give it that nice texture typically missing in pasta dishes. I managed to fit this in for a Sunday lunch ((because we didn’t get around to using the clams on Friday or Saturday night) in between dance class and soccer games and a trip to the airport . We dined al fresco, I got to surprise the family with some good news and it was like something out of an Italian movie. Grazie for reminding me about this satisfying dish. I’ve made spaghetti with fresh clams, parsley and lemon a few times using a recipe from The Bon Appetit Cookbook. I love it (especially all the garlicky juices at the bottom of the bowl) but the next time clams are on the menu I’ll be trying out your recipe. Adding buttery breadcrumbs, tomatoes and basil sounds like it would make an already delicious dish that much better! When I started reading the paragraph about the sardine, I thought you might say that they took the little fellow for a swim in their pasta and olive oil, then hung it back up to use again the following night. It’s a great story.